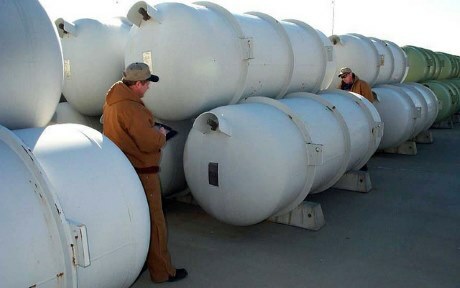 Mid-America Conversion Services - a joint venture of Atkins, Westinghouse and Fluor - has received approval from the US Department of Energy (DOE) to begin operation of its depleted uranium hexafluoride (DUF6) conversion facilities. The DOE in September 2016 awarded Mid-America Conversion Services a five-year contract to operate the facilities, located near Paducah, Kentucky and Piketon, Ohio, and to manage cylinder-storage yards at the DOE's Portsmouth and Paducah gaseous diffusion plant sites. The Portsmouth and Paducah gaseous diffusion enrichment plants ceased production operations in 2001 and 2013, respectively. The DOE has an inventory of about 700,000 tonnes of DUF6, a by-product from the gaseous diffusion uranium enrichment process. The DUF6 conversion plants convert the material into depleted uranium oxide for reuse or disposal and aqueous hydrofluoric acid for industrial use. Under the contract, Mid-America Conversion Services will also provide maintenance services for the conversion facilities and associated equipment, dispose of end products, and conduct surveillance and maintenance of the cylinder storage yards. The conversion plants were previously operated by BWXT Conversion Services.